Millionaire’s Shortbread is essentially a GIANT Twix bar! A layer of fudgey caramel filling, sandwiched between a buttery shortbread biscuit and chocolate topping YUM! This recipe is really straightforward but needs to be done in stages, as each layer needs time to set before you can add the next layer on top. Start by heating your oven to 180C/Gas Mark 4. 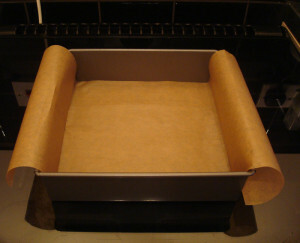 Then line a 20cm/8inch deep square tin with baking parchment, making sure there is enough to hang over the sides (makes it easier to take the shortbread out of the tin). Mix the sugar and flour together. 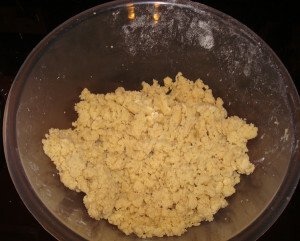 Add the butter and vanilla extract and using your fingers, rub it all together until the mixture resembles breadcrumbs. Tip the mixture into your lined tin and pat down and smooth, making sure to push the dough into all the corners. Using the back of a large spoon really helps with this. Prick the dough all over with a fork and bake in the oven for 30-40mins or until lightly golden. Mine took the full 40mins but its best to start checking it at 20mins as every oven is different. Leave to cool. 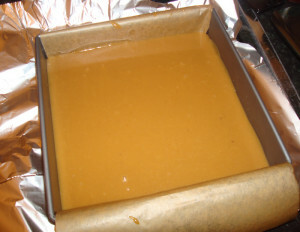 To make the caramel filling, melt the butter in a saucepan and then add sugar and whisk until incorporated. Remove from the heat and add the condensed milk. Mix together then put back on the heat and bring to the boil, stirring continuously. Once boiled, add the golden syrup and simmer the caramel for 5-7mins on a gentle heat until it thickens slightly, stirring continuously – you don’t want the caramel to stick to the bottom of the pan and burn. That will equal a bitter, yucky caramel. Remove the caramel from the heat and pour over your cooled shortbread base – yes, you can pour it straight from the pot while it’s still hot – your shortbread will be fine. Honest :-). Leave the caramel to cool for 15-20mins at room temperature, then move to the fridge for a further 20mins to chill and firm up. While the caramel is chilling in the fridge, melt your chocolate in separate bowls in the microwave. Do it in 30 secs bursts and stir inbetween to make sure all your chocolate is melted. Leave to cool down a bit – you don’t want your chocolate to be too hot when you pour it over your caramel, as it may melt through the caramel layer. Remove your tin from the fridge and pour your milk/dark chocolate over the caramel layer. 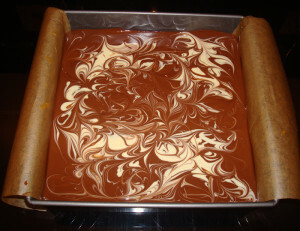 If you are not marbling your chocolate you can just set your tin aside and allow the chocolate to set. To marble the chocolate layer; spoon blobs of white chocolate over the milk/dark chocolate. Take a toothpick and without pushing down too far, swirl the two chocolates together in circular/figure eight motions until your happy with the final look. I was supposed to take a before and after picture of the marbling, but I got so excited that I completely forgot! Sorry. Set the tin aside and allow the chocolate to set. You can pop it in the fridge for 30mins or so to speed up the process. Once the chocolate layer has set, run a sharp knife along the edge of the tin and use the flaps to pull the shortbread out of the tin. Cut into squares and serve. It’s a bit easier to cut through the chocolate layer if you dip your knife in hot water first (wipe off the excess water with a tissue). Enjoy! Those look utterly fantastic! Very impressive. Thanks so much Frugal Feeding! I think I am actually obsessed with the recipe, this past week I’ve baked it literally five times…(I didn’t eat them all myself!). I let the Millionaires Shortbread go completely cold in the fridge before cutting. I then heat my largest sharp knife over the gas hob before cutting through it cleanly, wiping and re-heating the blade after each cut. I have seen comments telling you not to do this but it works perfectly for me everytime. I think the secret is using a knife that is almost as long as the width of the tin so you can get through it with just one cut.